Growing up my mother cooked a lot of tomato based dishes as my father was not a huge fan of creamy sauces. So when I would go out to restaurants this is what I ordered, and I mean regularly. I love a boscaiola sauce, it is truly one of my favourite things to eat, still. Now my husband also does not like creamy sauces, crazy I say, but thank goodness my kids love it, like I do. So creamy based dishes get cooked on days when my husband is not home or I have made something for him that the kids don't really like. It is rare I make two dinners, but every now and then I do. And why would I cook two dinners, because this is so easy to make. When the pasta is cooked, so is your sauce. This is so fast to make, and tastes so good, you really do have dinner on the table in 20 minutes, with very little effort, but a great end result. 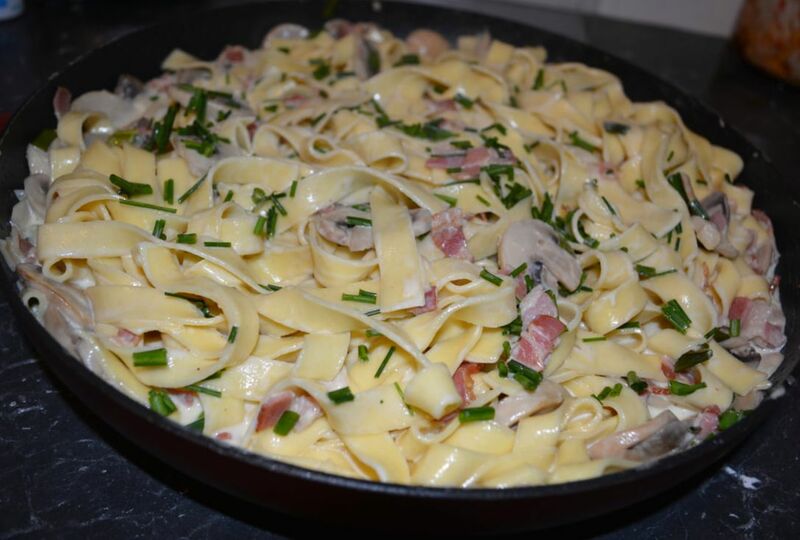 Now here I have made it with fettuccine, but feel free to cook it with spaghetti, tagliatelle, penne or tortellini whatever you like. So if you are looking for quick, tasty mid week meal, look no further, this is so good. Add water to a large saucepan, season the water with a teaspoon of salt. Bring to the boil. While the water is coming to the boil, chop the bacon, garlic, spring onions and mushrooms. Start the sauce: heat the oil in a large frying pan, add the bacon and fry for 2-3 minutes. Add the garlic, sauté for 30 seconds. Add the spring onions and mushrooms and cook, stirring for 3-4 minutes or until the mushrooms soften. Add the wine, simmer until it reduces by half. Add the pasta to the boiling water, stir it until the water comes back to the boil, the stirring stops the pasta sticking together. Cook the pasta following the packet directions. To the bacon mixture add the chicken stock, cream, a little salt and white pepper, to taste. Bring to a simmer and cook for 6-8 minutes or until the sauce reduces and thickens slightly. Once cooked taste for seasoning. Once the pasta is cooked, drain, set aside and keep warm. To serve, spoon the hot sauce over the hot pasta, toss to combine, sprinkle with some freshly chopped chives and top with grated parmesan cheese, if desired.